Ticks are blood-sucking parasites that can bite you and your pets. Ticks are generally found in woodland or in areas covered with tall grasses, where they feed on the blood of mammals and birds. As well as being unpleasant, biting pests, ticks can spread Lyme disease. The best way of protecting yourself and your family against ticks when you’re enjoying the Great Outdoors is to use a good tick repellent. In this Buyer’s Guide, we’ve reviewed five of the very best tick repellent products available. We’ve also included lots of useful information to help you keep your family and pets safe and ensure that you win the war against ticks! The products we’ve reviewed here are proven to be effective in repelling ticks. Click on the links to read more information about each product and to see users’ reviews. Once you’ve found a tick repellent that suits your needs, click to order and get ready to send the eight-legged, blood-sucking menace packing! Off tick repellent is effective against fleas, gnats, mosquitoes, flies, and ticks. The spray is easy to apply and is formulated with 25% DEET, making the spray extremely effective. The residue left by the spray gives up to eight hours’ continual protection. You can also spray your furniture and pets safely. Long-lasting protection from mosquitoes, ticks, biting flies, gnats, and chiggers. Formulated with 25% DEET-provides up to 8 hours of protection against mosquitoes. The repellent spray is easy to use. The spray leaves no unpleasant odor or greasy stains. 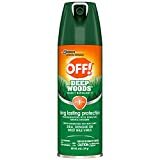 The DEET contained in the spray kills pests outright, as well as being effective in repelling them. DEET is not safe to use on or around young children. This version of Sawyer insect repellent is a lotion. The product also works to repel mosquitoes. The active ingredient in the formula is Picaridin, rather than DEET. The lotion works for up to 14 hours before you need to reapply it. The active ingredient, Picaridin is reputedly 20% more effective than DEET. The lotion is waterproof, so it won’t be washed off in the rain. The ingredients are all-natural, so you can safely use the lotion on children. The lotion does not have an unpleasant odor. Some users report skin rashes have developed after using the lotion. PSA: Always test the product on a small area of your skin before more widespread application. This offering from Sawyer Products is a repellent spray. The product contains very high levels of DEET (98%) and is designed for use in areas of very heavy tick infestation. The product is easy to apply, has little odor, and can be used anywhere on the body. The spray is highly effective at deterring ticks. The product can be used safely anywhere on the body. The repellent effect lasts for up to 10 hours. The spray has very little odor. The spray leaves a greasy residue on the skin. The product is intended for deep woods use and should not be used on children. 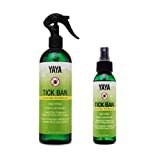 Tick Ban by Yaya is made from natural ingredients only and contains no DEET. That means the product is safe to use on kids and pets, and it contains no harmful chemicals that could damage the environment. The plant-based spray is made in the USA, using organic essential oils. PROVEN EFFECTIVE - independently lab tested for efficacy. SAFE FOR THE WHOLE FAMILY - adults, kids and dogs. The product is 100% natural, contains no DEET, and is safe to use around kids and pets. The spray smells nice and doesn’t leave a greasy residue. This product does work, but it isn’t as effective as DEET-based repellents. This premium product from Sawyer is intended for use on your clothing, rather than on your skin. 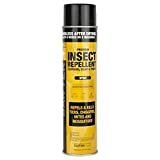 The spray is very effective and works well even though it doesn’t contain DEET. The spray is very effective at keeping ticks off your clothing when you’re camping in or hiking through woods or long grass. The spray is waterproof and works for up to six weeks, even after washing. Despite the potent formula, the spray is odorless. The drawback to using this product is that it can cause an unpleasant reaction if it comes into contact with your skin. Ticks are not insects but arachnids, like spiders. These tiny creatures live in areas of dense, damp vegetation and survive by attaching themselves to mammals and birds, feeding on their host’s blood. Tick bites can cause extreme itchiness and skin irritation. Even worse, ticks can carry Lyme disease and other health conditions, some of which can be fatal. Ticks are so tiny that you might not even notice you have one. Ticks can’t fly or jump; they latch onto the passing animal’s fur, or your skin, and hitch a ride. Unlike fleas, ticks don’t set up home on the host; once they’ve eaten enough, they drop off and wait for the next meal to pass by. Ticks can be as tiny as a pinhead or as large as your fingernail, depending on their age. Generally, ticks look like small, greyish-colored, rounded pebbles. Usually, these pests find their way into your home on your pets or your clothing. Once inside your house, ticks will pitch camp pretty much anywhere, including on your furniture, in your carpets, and even in your bedding. If a tick has just had a meal, it can survive in a damp, warm place for up to three days! Whenever you take Fido for a walk in the woods, check him over thoroughly for ticks as soon as you get back. Look out for these bloodsuckers on areas of exposed skin, including on your dog’s face, underbelly, the insides of his legs, and his armpits. If you discover a tick on your dog, don’t try to pull it off; the head and mouthparts could be left behind embedded in the dog’s skin where it could cause an infection. Instead, ask your vet to remove the tick with a special tick-removal tool. Rather than treating ticks once you have an infestation, it’s better to take preventative measures to keep them away in the first place. If you enjoy hiking in the deep woods or walking your dog in marshy areas where the grass and vegetation are long, you must use a decent tick repellent such as those we’ve reviewed for you in this Guide. Tests carried out by Yale School of Public Health have shown that DEET is effective at repelling ticks. Other repellents that contain natural herbal substances and Picaridin are also popular, but there are no recorded tests of their efficacy against ticks. Your shoes are the main interface for tick nymphs and larvae that crawl up from the forest leaf litter in search of a meal. Apply your chosen repellent to your shoes and socks to create a barrier at ground level. Adult ticks climb up low lying bushes and tall grasses, latching onto your calf or above. Treat your pants or shorts and apply DEET repellent to your legs if they’re exposed. In areas where tick infestation is high, wear treated clothing from top to bottom. Choose light-colored clothing to make it easier to see ticks that try to latch onto you. Wear close-weave fabrics to prevent ticks from hiding inside the coarse weave of material such as heavy canvas. Also, tuck your pants into your socks to keep ticks from crawling underneath your clothing. Before heading home from a walk in tick country, always check yourself carefully for the pests. If you live in an area that’s prone to tick infestations, you can keep your yard clear by making it tick-unfriendly. Keep grass and shrubbery well-trimmed, especially around damp areas and ponds. Ticks love cool, damp places, and by keeping your yard open and exposed to the sun, you’ll deny them their preferred habitat. In the fight against ticks, using the best tick repellent is essential. If you don’t like the idea of using an aerosol spray, you might want to choose a tick repellent lotion. Lotions are as effective as sprays, and they don’t leave behind a greasy residue on your skin. If you have kids, you might prefer to use a lotion on their skin, backed-up by spraying their clothing with a DEET spray for extra protection. To be sure that no spray is inhaled, treat the clothes before the wearer puts them on. Spray repellents are the most popular form of tick deterrent. Sprays typically contain the highest concentration of active repellent ingredients, making them the most effective at keeping ticks at bay. Sprays do contain the highest levels of DEET, which can be harmful if you over-apply it or accidentally inhale the spray. Also, sprays tend to have a strong, chemical odor that can be unpleasant, and they can leave a greasy residue behind on your skin. That said, sprays cover a much larger area than lotions, making them quicker and easier to apply. Repellent spray is also more economical to buy because you don’t need to use as much as you would with a lotion. If you don’t like the idea of using toxic chemicals to deter ticks, there are several all-natural repellents you could choose. These products are usually made using 100% organic, natural ingredients such as lemon and citrus oils, making them safe to use on pets and children. So, for an environmentally-friendly option that’s chemical-free, choose a natural repellent spray. But keep in mind that the ingredients in these products may not prove as effective as the well-tested chemical options. In this section of our Guide, we’ve answered some of the questions that people often ask about ticks and tick repellents. If you can’t find the information you need, get in touch by email, and we’ll try our best to help you! Q: What is the best natural tick repellent? A: Citrus, peppermint, and eucalyptus oils are all good tick repellents. A spray made from these ingredients smells pleasant, but it does leave an oily residue behind, and you’ll need to reapply every four hours for the repellent to remain effective. Q: How can I stop ticks from getting on me? A: You can keep ticks off by using a good tick repellent and keeping yourself covered up when walking in tick-infested areas. Q: Can ticks live in my house? A: Ticks that have recently taken a blood meal can survive in a damp, warm environment for several days. Always check your clothing when you return from a walk in tick country before you put your clothes in your washing hamper. Ticks that haven’t fed will die within 24 hours. Q: Do ticks fall off by themselves? A: Once a tick has latched onto a host to feed, it will stay in place until it is engorged with blood. The tick will fall off of its own accord when it’s ready to lay eggs or has eaten its fill. Q: How can I keep ticks off my dog without using chemicals? A: If you don’t want to use chemical tick repellents on your dog, you can make an effective natural solution from lemon juice and water. Take a fresh lemon and chop it into small pieces. Immerse the cut lemon in a pint of boiling water and allow it to steep overnight. Put the solution into a spray bottle and spray your dog all over, focusing on the area behind the ears, at the base of the tail, and under the armpits. Use the spray before you take your dog out walking in areas where there are ticks. Ticks are blood-sucking parasites that can carry diseases, including Lyme disease. You can prevent ticks from latching onto you by using an effective tick repellent and keeping your skin covered when walking in tick country. 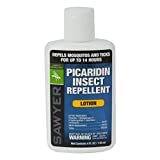 We especially like the Sawyer Products Premium Permethrin Clothing Insect Repellent. The product is a potent and effective tick repellent spray that is designed for use on your clothing. Even though the spray doesn’t contain DEET, it still works very well. Once applied, the spray will withstand washing and rainwater, remaining effective for up to six weeks, so it’s excellent value for money. There’s no unpleasant smell either, making the product pleasant to use. We recommend that you also use TICK BAN by Yaya Organics – Extra Strength Tick Repellent on your skin, backed-up by the Sawyer Clothing Insect Repellent on your clothes. Tick Ban is 100% natural and chemical-free, so it’s safe to use on kids and pets too.